Composed by Carl G. Glaser (1784-1829), George J. Elvey (1816-1893), John Hatton (1710-1793), Oliver Holden (1765-1844). Arranged by Christine Sullivan Robbins. Christian, Sacred, General Worship, Recital. Score. 5 pages. Published by Christine Sullivan Robbins (S0.18624). Celebrate Christ's majesty with a piano medley of four regal hymns: Crown Him with Many Crowns (Diademata), Jesus Shall Reign Where'er the Sun (Duke Street), All Hail the Power of Jesus' Name (Coronation), and O for a Thousand Tongues to Sing (Azmon). 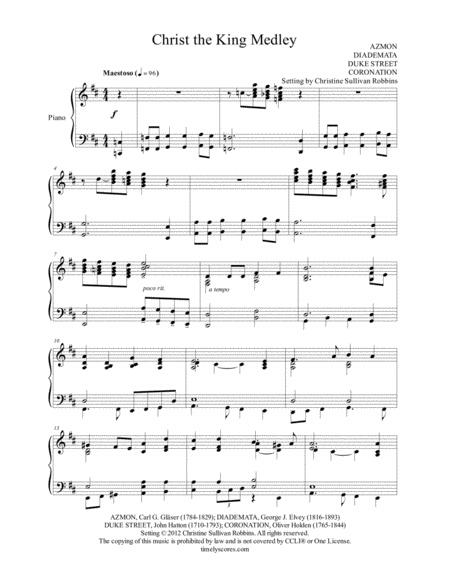 The stately style of this arrangement makes it an excellent selection for worship services and recitals that require strong, impressive music.